“As Elder Colcord was reading, Sister White interrupted him, saying: “Elder Colcord, I would not publish these articles, if I were you.” “Why not?” He inquired. “Because they are not correct.” She answered. Elder Colcord offered no argument to refute her position, and we all seemed perfectly satisfied with the statement; in fact, I had never heard an explanation that was satisfactory before. Then in Romans 8:26, “likewise the Spirit also helpeth our infirmities: for we know not what we should pray for as we ought: but the Spirit itself maketh intercession for us with groanings which cannot be uttered” (by man). Thus – These statements make the Holy Spirit a high priest forever. Every specification was met by the Holy Spirit, A HIGH PRIEST FOREVER, but cannot be met by any angel or human being. “It was Christ who spoke through Melchizedek, the priest of the most high God. Melchizedek was NOT Christ, but he was the VOICE of God in the world, the REPRESENTATIVE of the Father [MELCHIZEDEK WAS THE HOLY SPIRIT].” – Selected Messages, Book 1, p. 409. “THE HOLY SPIRIT IS CHRIST’S REPRESENTATIVE, but divested of the personality of humanity and independent thereof.” – The Desire of Ages, p. 669:2. Posted on October 21, 2009, in Melchisedec and tagged Melchisedec, melchizedek. Bookmark the permalink. 5 Comments. Thank you for contacting the Ellen G. White Estate. Elder Haskell published three short articles about Melchizedek in the “Bible Training School” paper that he published in South Lancaster, Massachusetts. I have attached a PDF file giving you all three. In the first two he asserted that Melchizedek was the Holy Spirit. In the third article he did not make this assertion, but observed that the Bible says Melchizedek was a man. Actually, he had listed this characteristic in his first article, but then he seemed to ignore it in his conclusion. Thank you for calling today. You asked for the specifics in regard to any who contradicted G. B. Starr’s account of Mrs. White’s supposed identification of Melchizedek as the Holy Spirit. I am enclosing three documents from our files. 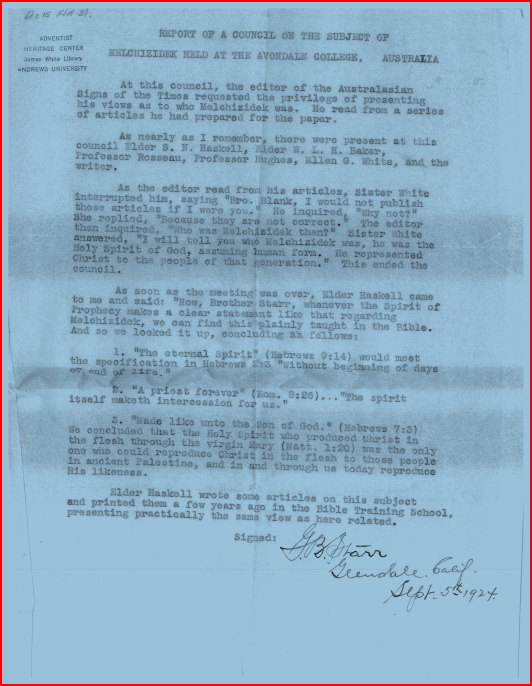 The first is the statement of Elder Starr, showing that it was articles by Elder Colcord which raised the question in the first place. Elder Starr then outlined his recollection of what Mrs. White had said. The second item is Elder Colcord’s statement, which flatly denies that Mrs. White had identified Melchizedek at all, though he believed she had said he was a “representative” of the Holy Spirit. Colcord then went into what I would call a “flight of fancy” on the question, putting great weight on “The Book of Jasher.” Unfortunately, though there is indeed a Book of Jasher named in the Bible, we don’t have that one. All we have is a much later book whose unknown author gave it that name in order to try to gain credibility for it. I would give no weight to arguments based on this book. The third item is a statement by D. E. Robinson, who served as one of Mrs. White’s secretaries for many years, married her granddaughter Ella, and later worked with the Ellen G. White Estate. Robinson cites a couple of statements in print from Mrs. White about Melchizedek which help to establish her view that Melchizedek was a representative of the Father. It strikes me that this does not require him to be someone supernatural. Rather, he was someone whom God used. Abraham gave him tithes because as a priest he did represent God. In the context of Hebrews, I do not understand the Bible to be presenting Melchizedek as someone divine. Rather, the Bible merely notes that his genealogy is not recorded in Scripture and in fact that his descent must not be Levitical, since Abraham had not yet borne Isaac and his descendents. This becomes an opening, a precedent, for the High Priestly ministry of Jesus, who also did not descend from the line of Levi and Aaron. Speculations about Melchizedek’s divinity are, in my view, misplaced.